Today was our first full day with the students at Hengshui. We were celebrities to say the least: each one of us was asked to exchange emails with several students. Hugh Smith was quite the hot commodity with the Hengshui girls. The day began with a treasure hunt around the campus. Along with the other American students, we were assigned to a Hengshui student who could only help with directions and not translations. This made for some very intriguing encounters, including a woman running away from me, laughing hysterically as I attempted to communicate. At the end of the treasure hunt we met in the principal’s office where each group received a small gift. Gift giving is an essential part of Chinese culture. Next, we watched the students run around a track during their exercise break which was rather interesting despite how it sounds. They run in army barrack-like formations, so tightly packed together that it’s amazing how they don’t trip over each other. 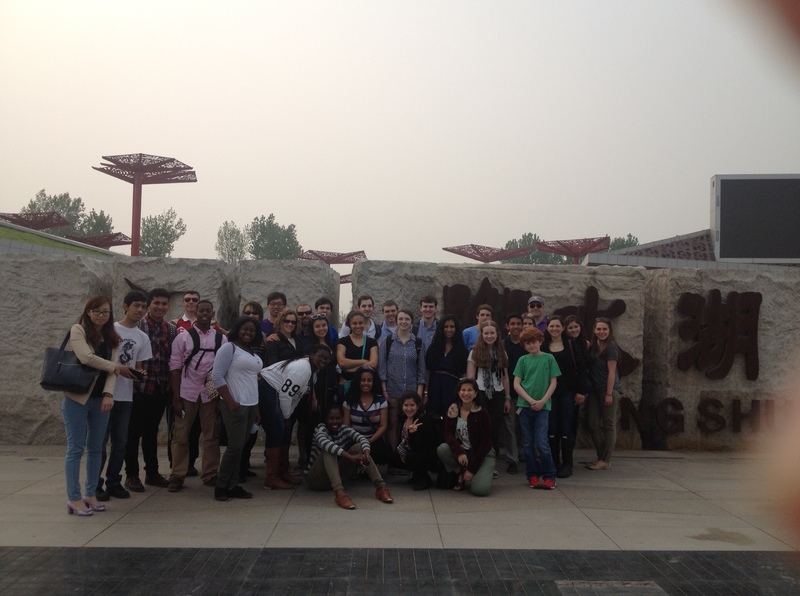 Students from Andover High and Shea High (Rhode Island) at Hengshui Lake. Next we all got a chance to observe a class in the school. Some students went to see English class, some to Biology, others to Math and a couple of the guys and I tagged along with a P.E. class. Joe Hallal, Dr. Lord’s sons and I challenged some other Hengshui boys to a basketball game. We drew a crowd of about 30, but no worries Warriors, we made you proud. We then went with a select few students from Hengshui to lunch at a mall and another scavenger hunt in an authentic Chinese marketplace. Each group was given 50 yuan to find an object assigned to them. The only thing was that we didn’t know what the object was because it was printed on a piece of paper in Chinese. Luckily, after about 10 shop owners shaking their heads and pointing us all further into the depths of the market place, my group was able to find our abacus for sale. After that we were free to shop on our own. We then arrived back at the school for another performance rehearsal. Lacey Kirks helped us out a lot by taking lead vocals and we were able to brainstorm and come up with a suitable dance for our song. The performance is tomorrow so wish us luck! The day at Hengshui ended with dinner and lessons on how to make dumplings and noodles out of dough. The students were all ecstatic to teach us more about their culture and asked hundreds of questions about ours. More than once the students asked if our school days were stressful- it seems that like theirs are extremely so. They wake up at 5:30 every day and study until 11 pm. We then returned to the hotel where several of us took up the opportunity to lounge in the hot spring spa available to all guests. Now we’re off to bed to get some rest for the big day tomorrow. Wish us luck and keep reading to hear how we do in the performance!